You can find large quantities of sea glass at only a handful of beaches in the world, and Glass Beach is one of them. Until 1967, the beach was used as the city's landfill and was covered by all kinds of waste, including colored glass. A major cleanup effort, combined with the effect of the tides, removed all the litter smoothed the glass. Today, the shore is awash with millions of glass pebbles. You also can view a vibrant ecosystem in the tide pools, which are home to a variety of aquatic species. Note that it's illegal to remove glass from the north part of the beach, which is a part of a state park. 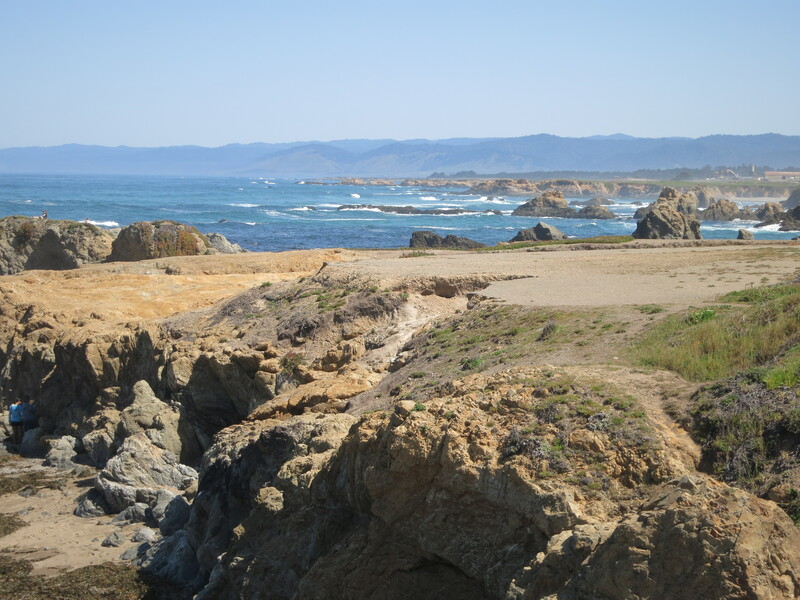 Plan to visit Glass Beach and other customer-reviewed, writer-recommended Fort Bragg attractions using our Fort Bragg driving holiday planner. I thoroughly enjoyed our visit to Glass Beach. The reason for the four stars is the access for the main beach to look at the glass fragments that have been smoothed out over a long period of time. It is quite a steep walk down and climb back up to get to and from. Wear proper footwear and just bring your picture taking device of choice. They want to preserve the beach and make sure glass is left there for generations of visitors and locals alike to enjoy. Once there, one can take the time to enjoy the view, touch the sand/glass and take a multitude of pics for memories. If you love the ocean and nature in general such as myself, there is plenty to see. If you plan to picnic, eat first, clean up after yourself, and return belongings to your vehicle. Dusk to dawn rules apply and all dogs must be leashed. If you go for the glass, please take the shells instead. They get smoothed into gems just like the glass, but they’re far more beautiful. Like blue abalone colored pearls. Unlike the glass, they’re constantly grown in the ocean and quickly become sand. The glass is only beautiful when you see a beach covered in it, not in your pocket. Don't believe the reviews about there being no glass left. I *just* went there and there's tons of glass. The pieces are tiny but numerous and if you look you'll find bigger pieces and some abalone shells! Honestly I bet that's why some of these reviewers are salty; they wanted bigger pieces. Or they didn't go to the correct beach. (Don't worry, it's labelled.) It's a large beach with many spots of glass. Going down into the bluff is worth it as there's a spot with nothing but glass. It was worth the six hour drive for me and I will definitely return. Side note: I rated this four stars because no one reads five star reviews but this place is absolutely worth five stars. 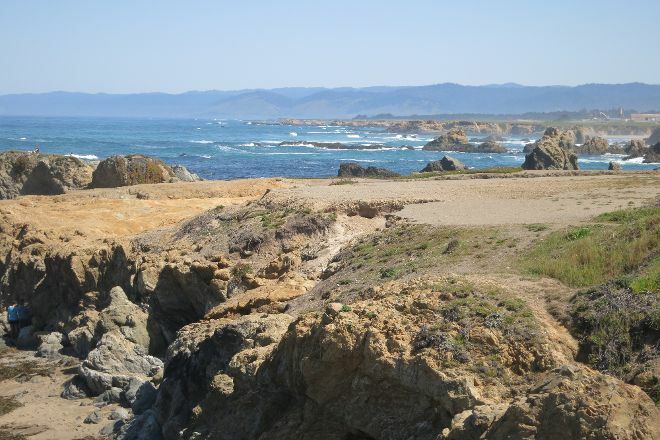 I heard about this beach when I was in Fort Bragg,CA this father’s day weekend. We took the main entrance to get down to the beach. The beach was rocky and little bit harder to get down to. Once we got down to the sandy area, there was a little bit of gravel and beach pebbles and that’s where you will see all sea glasses. It was cool and pretty since we get to see the seals and sea lion and along with the sea glasses. I heard there was another area that has more sea glass and bigger pieces but the city took the walking path away and reserved that area so no one can’t really go down to that area. However, this is not a bad spot either. If you’re in the area go check it out. There are some absolutely beautiful views at this beach. The surrounding rocks and Rocky coastline is gorgeous, and the Glass Beach itself is quite beautiful. It's very pretty to see a beach of glass vs. sand. It's quite unique and quite scenic. There's no shortage of beautiful views to be had here, and many beautiful views which aren't the Glass Beach itself so don't hesitate to look around and enjoy the views while you are here. I will definitely be back. Every day, we help thousands of travelers plan great vacations. Here are some tips on how to use your Listing Page to attract more travelers to your business - Glass Beach. Promote your permanent link - https://www.inspirock.com/united-states/fort-bragg/glass-beach-a93944249 - on your website, your blog, and social media. When a traveler builds a plan from this page, the itinerary automatically includes Glass Beach. This is a great way for travelers looking for a great vacation in your city or country to also experience Glass Beach. Promoting your link also lets your audience know that you are featured on a rapidly growing travel site. In addition, the more this page is used, the more we will promote Glass Beach to other Inspirock users. For best results, use the customized Trip Planning Widget for Glass Beach on your website. It has all the advantages mentioned above, plus users to your site can conveniently access it directly on your site. Visitors to your site will appreciate you offering them help with planning their vacation. Setting this up takes just a few minutes - Click here for instructions.